It can be difficult to understand the structure and connections in an OpenMDAO model. OpenMDAO provides a script to generate a diagram which visualizes both in an integrated view. The diagram makes use of a partition tree to display the structure and an N2 diagram to display the connections. In addition to helping the user understand an OpenMDAO model, this tool can also be used to detect bugs in OpenMDAO models. An N2 diagram , also referred to as an N2 chart, N-squared diagram, or N-squared chart, is a diagram in the shape of a matrix, representing functional or physical interfaces between system elements. N2 diagrams have been used extensively to develop data interfaces. A basic N2 diagram is shown in the figure below. N2 diagram definition taken from NASA Systems Engineering Handbook. The system functions are placed on the diagonal; the remainder of the squares in the N x N matrix represent the interface inputs and outputs. Where a blank appears, there is no interface between the respective functions. 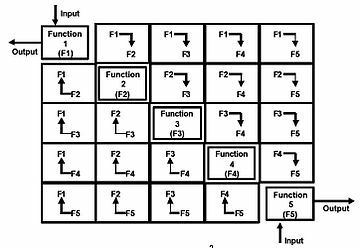 Data flows in a clockwise direction between functions (e.g., the symbol F1 F2 indicates data flowing from function F1, to function F2). The data being transmitted can be defined in the appropriate squares. The clockwise flow of data between functions that have a feedback loop can be illustrated by a larger circle called a control loop. This section will give an overview of an OpenMDAO partition tree/N2 diagram and how to use it. The working example below shows the OpenMDAO model contained in the example file sellar_state_MDF_optimize.py . In an OpenMDAO partition tree/N2 diagram, the partition tree is on the left, and the N2 diagram is on the right. The partition tree shows the structure of the OpenMDAO model starting with the root node on the left and its children to the right. These children (from left to right) include Groups, Subsystems, and Outputs. Each node’s height in the partition tree is sized by the total number of leaf nodes; the more leaf nodes, the taller the node. When the partition tree is first loaded, all leaf nodes (the rightmost nodes) are Outputs. Every node in the partition tree is in execution order from top to bottom. The legend below the diagram explains the colors of the nodes in the partition tree. Left-clicking on a node in the partition tree will allow you to navigate to that node. Right-clicking on a node will collapse/uncollapse it. You can also control what is displayed in the partition tree using the buttons in the Collapse Algorithms and Navigation sections above the diagram. To the right of the partition tree is the N2 diagram. The rightmost nodes of the partition tree are on the diagonal of the N2 diagram. The connections are listed on the off-diagonal of the N2 diagram. Connections go from source to target in a clockwise order, so a connection in the upper right goes in normal execution order, but a connection in the bottom left is a feedback. Hovering over an on-diagonal element will show source-to-connection arrows going to and/or from that element. Hovering over an off-diagonal upper right connection element will show the clockwise source-to-connection arrow. Hovering over an off-diagonal lower left connection element will show the clockwise source-to-connection feedback arrow, along with the associated execution cycle going back to the source. A click on any element in the N2 diagram will allow those arrows to persist. You can clear the arrows using the Clear Arrows button above the diagram. The most interesting display occurs when you hover over the element below the diagonal. It shows the connection that make up a cycle in the model. The legend below the diagram explains the symbols used in the diagram. Generating the N2 diagram is very simple. The user only needs to call the view_tree function on a Problem object. The Problem object must call setup() before being passed to view_tree . There is no need to call run on the Problem . Generates a self-contained HTML file containing a tree viewer of the specified type. Optionally pops up a web browser to view the file. problem (Problem) – the Problem (after problem.setup()) for the desired tree.